We are the #1 dance club and oldest venue in the Utherverse. This year we are celebrating our 10th Anniversary! Come and join our parties and have fun with all of us. Make new friends or lovers and become part of the Epsilon family. Since 2009 and through a combination of modern techniques and fashionable design, Club Epsilon sheds new light on how to live a life of dance, fun and friendship. Having fun and doing it with friends, that's the vision of Club Epsilon. On the website you will find anything you want to know about the history, the present and the future of Club Epsilon. 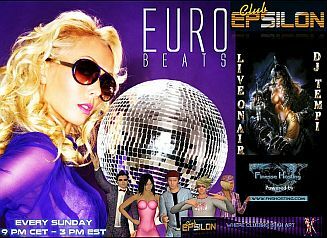 Club Epsilon has been designed for all dance loving people. The CE Staff will do anything in their power to make your stay as enjoyable as possible. Club Epsilon does not discriminate and welcomes ALL guests. Respect all our members and guests. We use our right to refuse access to the club if the spirit of love, friendship, respect and fun is in danger. Club Epsilon welcomes you into a whole new world. Have fun and enjoy.